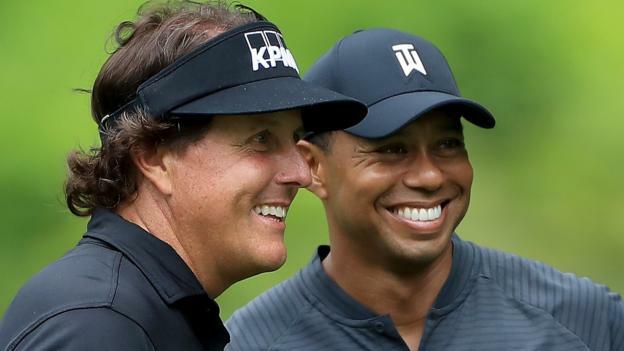 Golf greats Tiger Woods and Phil Mickelson will go head-to-head in a winner-takes-all $9m (£7m) exhibition match in Las Vegas. The Americans, who have 19 major championship titles between them, will face off in the 18-hole event at Shadow Creek Golf Course on 23 or 24 November. The contest, which coincides with Thanksgiving weekend in the US, will be screened on pay-per-view. Woods confirmed “The Match” on social media, saying: “It’s on”. The possibility of a duel between the former Ryder Cup team-mates has been mooted repeatedly down the years. Woods, a 14-time major winner, has won over £88m prize money on the PGA Tour in comparison to Mickelson’s £68m. “It’s an opportunity for us to bring golf to the masses in prime time during a period where we don’t have much going on in the world of golf,” Mickelson told ESPN. Despite the good-natured approach, there is no chance of the duo sharing the purse, with Mickelson saying that the event had to be winner-takes-all. Former world number one Woods returned to golf this year after missing most of the previous two years due to recurring back problems. The 42-year-old finished tied for sixth at The Open and was second at the PGA Championship earlier this month while 48-year-old Mickelson missed the cut.